We applied to HLF for grant aid in March 2009 and were successful in being awarded a Development Grant of almost £20,000 which enabled us to develop our proposals to the standard required for a full application. In September 2010 our architects, Caroe and Partners, invited tenders from six contractors with Dorian Phillips of Llanboidy, Whitland, receiving the contract. In December 2010 HLF confirmed its grant of £65,000. We were fortunate that SITA Trust supported the project with funding up to £50,000 with the Friends of St Mary's being the Contributing Third Party to reimburse 11.5% (£5,750) of the grant. Work commenced on 26 April 2011 after a programme of work which avoided disturbing bats had been agreed with the Bat Conservation Officer. 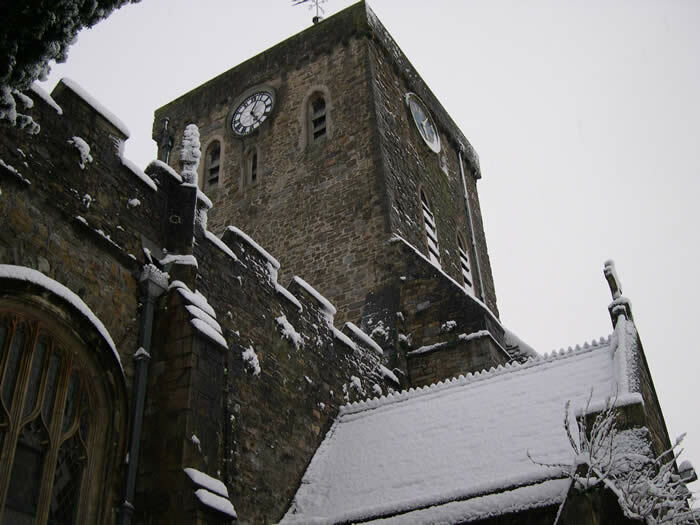 It involved the repair of the tower roof including removal of damaged slates and leaking copper lined guttering, repointing, stone work repairs, repointing the external walls and repair of beams and structural timbers together with all ancillary work. The roof was reslated with Penrhyn slate and gutters relined with lead. Internally, beams exposed above the ringing chamber were found to be rotted and in a very poor condition. They were replaced and stone corbels installed. Ceiling removed, renewed and decorated. Rendering and cement pointing removed from very damp walls and after drying, limewashed. It was needed urgently to safeguard the medieval bell frame in one of the earliest church towers in the county.The cost of this work was £160,000 and the Practical Completion Certificate was issued on 20 December 2011. The Austin Bailey Foundation; Haverfordwest Town Council; Haverfordwest Gild of Freemen; Sir John Perrot's Trust; Allchurches Trust Ltd; Mr and Mrs GA Marsh; Miss Joan Rees; Haverfordwest Ladies Choir; Mr JAR Folland; The Mayor(collection at the Civic Service of Nine Lessons and Carols); donations in memory of Bernard Merriman, Alan Barker, Mrs Alice Earle and Miss Nancy John; The E & G Morgan Charitable Trust; Mr MDR Thomas; Garfield Weston Foundation; The Veneziana Fund; Welsh Church Act Fund.